Dr. Doyle is Associate Professor, Department of Obstetrics and Gynecology, University of Rochester Medical Center School of Medicine and Dentistry, Rochester, New York. Dr. Duecy is Associate Professor, Departments of Obstetrics and Gynecology and Urology, University of Rochester Medical Center. Dr. Wood is Research Associate Professor, Departments of Obstetrics and Gynecology, Urology, and Neurobiology and Anatomy, University of Rochester Medical Center. 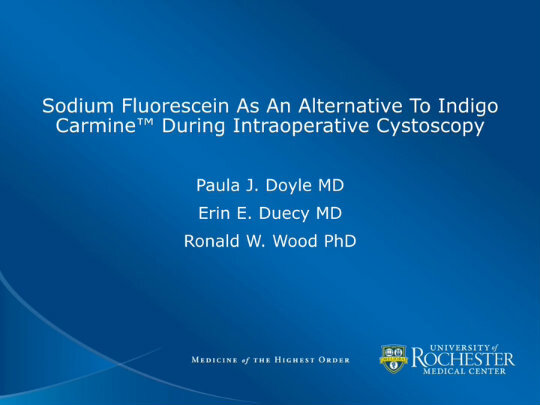 With indigo carmine unavailable for use during cystoscopy, surgeons need an alternative contrast agent. Could sodium fluorescein be of use and, if so, how? These surgeons share their experience, born out of clinical necessity.